This Package listing is for a 10 Pack, or Ten Units of the LED CHECK PRESENTER Custom Printed in Full Color, and charging cables. 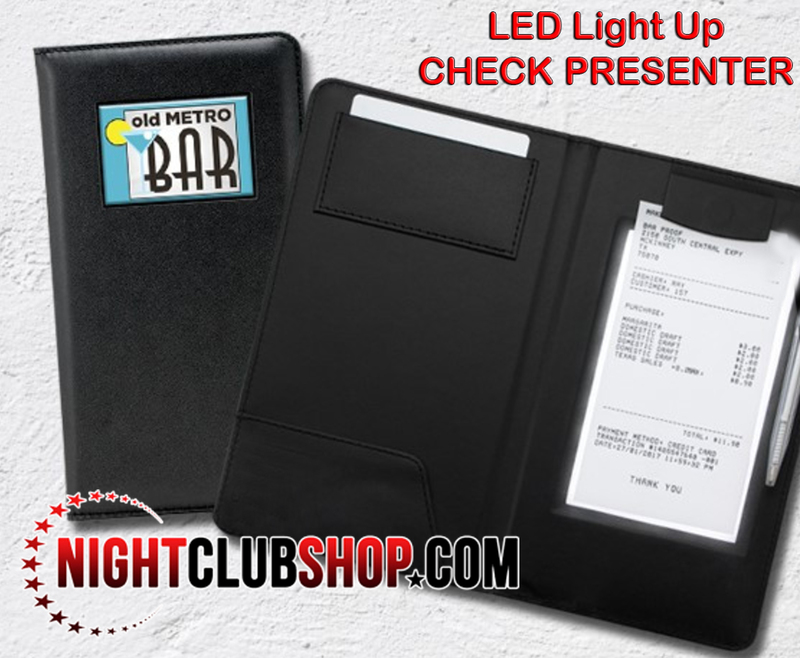 This Illuminated and Backlit "LED Check Presenter" or "LED light up Bill holder/Billfold" is ideal for upscale restaurants, Lounges, Bars, and Nightclubs of any size. These LED Check Presenters create a stunning illuminated view for your staff as well as patrons of their receipt or bill in a dark or low lighting environment such as VIP sections, VIP Tables, Beachside, Outdoors, and pretty much anywhere you need to bill a client with low visibility because it is a dark and low lit area. The interior of this LED Check Presenter display features a sturdy credit card pocket, as well as a cash slot on the left flap. Each LED check presenter has a magnetic clasp to hold bills in place. The receipt, invoice, or bill is held over the LED Light up illuminated surface, which alone measures 3-3/8” wide x 5-5/8” tall. The full Size of this LED Billfold check Presenter is 5"inches wide by 9.3"inches in heigth, and it is .5" inch deep. For LED MENU/CHECK PRESENTER Charging, a micro USB charger is inserted into a discreet, pin-sized hole on the bottom of the unit. Yes, These LED Check Presenters comes with a single port charger included with each unit. You may also purchase our Multi-6 charger and have your items shipped together with your order. This black LED check presenter will be fully charged in 4-5 hours. Once full, the battery lasts for approximately 7-8 hours of continuous use and may last even longer when not continually open. Production Time: Blank ships within 24-48 hours. You may choose expedited shipping to ensure your blank product is shipped within 24 hours. Logos require 3-5 days production time after proof is approved by customer. These are not available for expedited shipping until we have produced your logo the first time. We will hold extras of your logos for expedited shipping on future orders! *Item Dimensions: 5" x 9.3" x .5"
*Customization Options: Full color logo application. *Logo Size: 3" x 2"
To Purchase Single Units of the New "LED CHECK PRESENTER"
This LED Check Presenter can be purchased choosing the "Custom Printed Logo Option" which entails Full Color Printing in the Front face section of the LED MENU/CHECK/BILLFOLD. For Customization Upload your High resolution Logo or Please E-Mail your Logo or Art to Info@Nightclubshop.com including your name and order number on the email, our art Department will always send a proof for your approval before we Print/Customize your order.